This also echoes the distance of a Lake Crescent trail I want to do later this year. 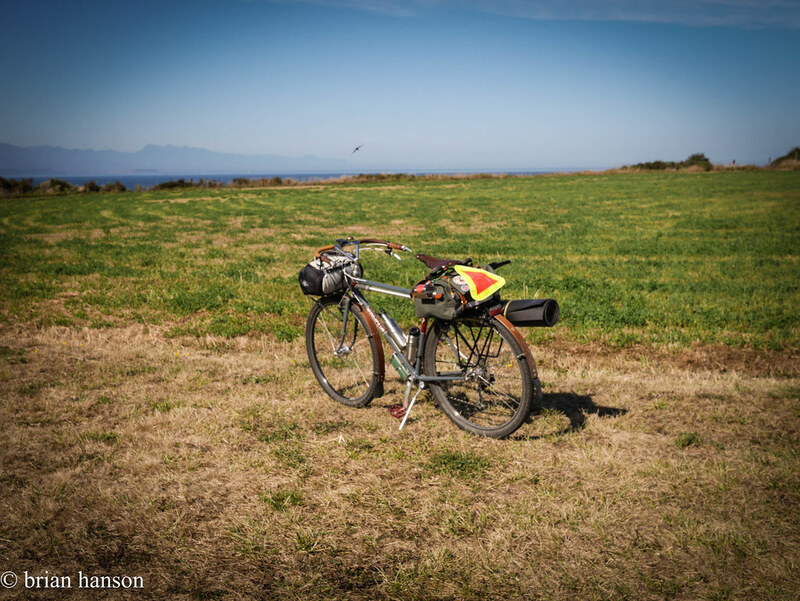 That gig is mostly singletrack, but I would use the same equipment. I got underway around 4:45pm on Monday. I figured it would take 2-3 hours, so I would likely have light to set up camp. 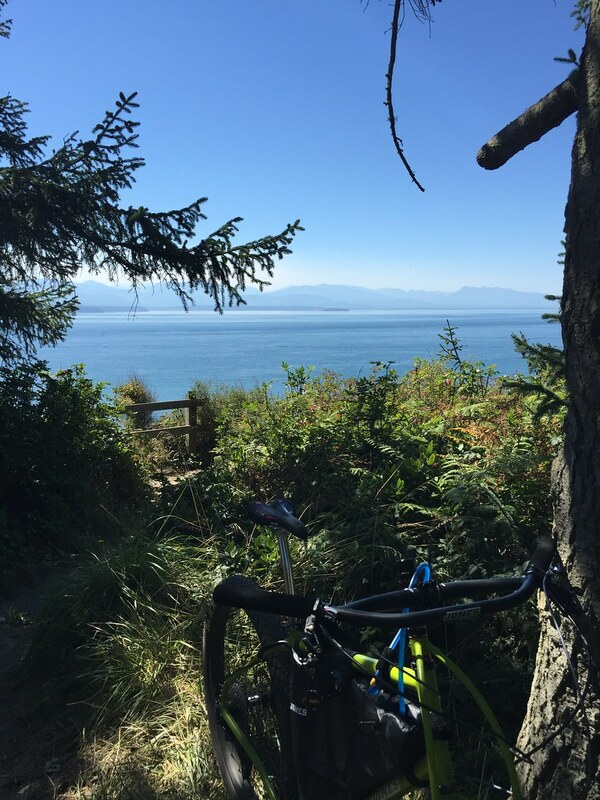 John and I had explored Fort Ebey’s mtb trails a few days earlier, so I knew where the hike/bike campsites were. I packed light. There was a burn ban, so I didn’t bother bringing a stove. Just 2 water bottles, a toaster pastry for breakfast, and a can of salmon for dinner. Easy. 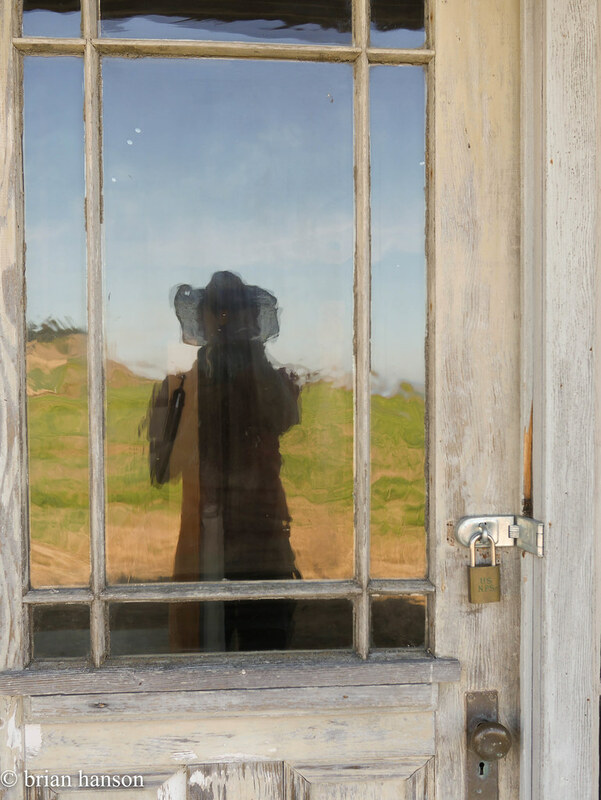 I wore the clothes on my back and brought along a pair of wool long underwear for sleeping. No rain in the forecast. Other than that, just my hammock, fly, sleeping bag and roll. Oh yeah – I strapped some sandals on, in case the feet got sore, but that was just unused extra weight. I think the whole thing weighed in under 10 pounds. The way up was stunning and uneventful. 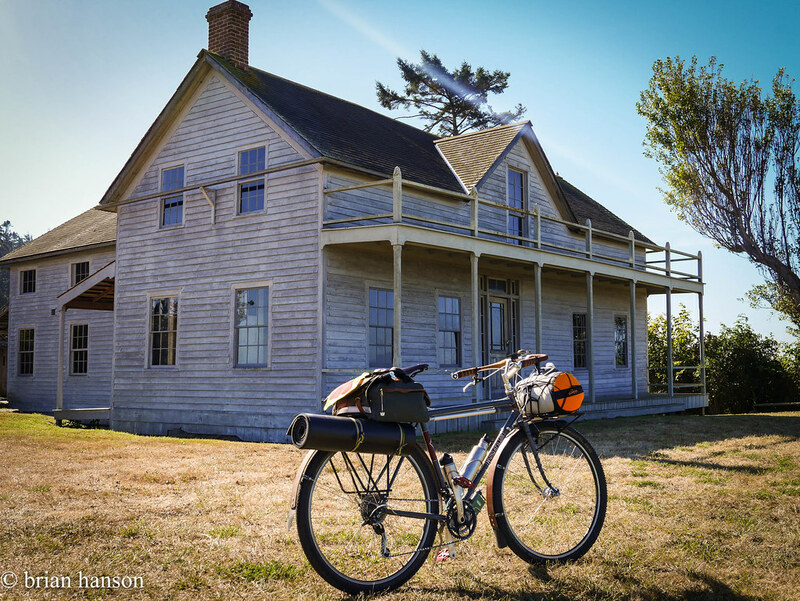 Heading north, I passed South Whidbey State Park, and Greenbank Farm. 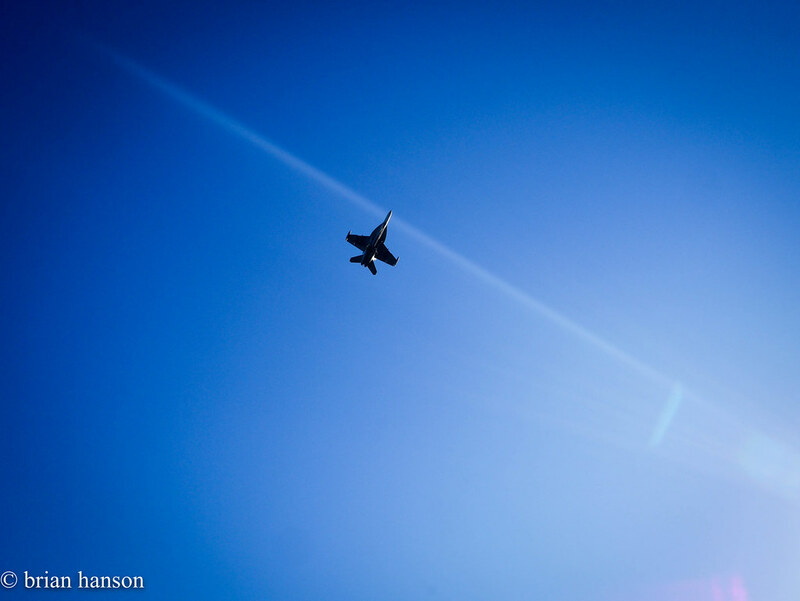 The stretch from Greenbank up to Coupville had some great hills and views, and the Navy Growlers were out practicing on the outlying field near Admirals Cove. 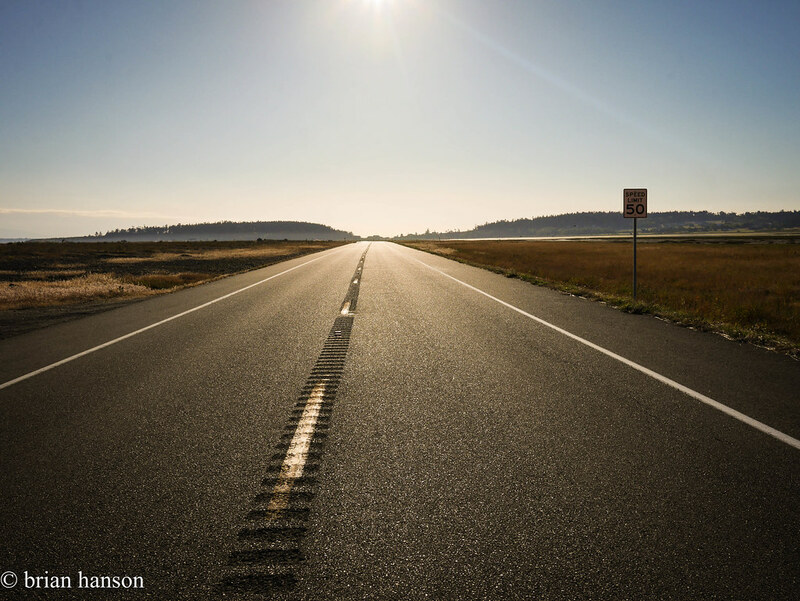 The long stretch across Keystone to Fort Casey yielded a few seals and many sea birds, but I saw not much traffic on a Monday night. 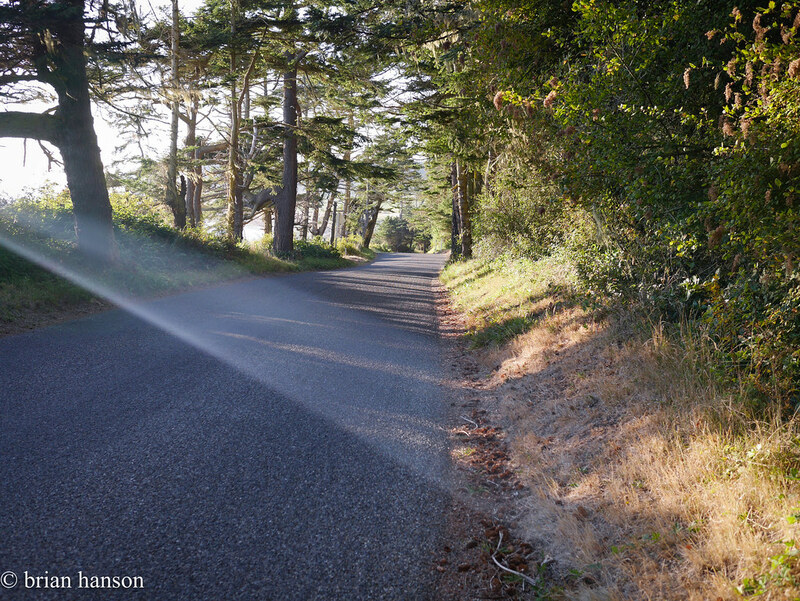 I searched through Fort Casey for a back route, and thought I had it following a gravel trail by the lighthouse, but it ended in a private road. I left it to chance, and wasted a few minutes, but it was worth the views. 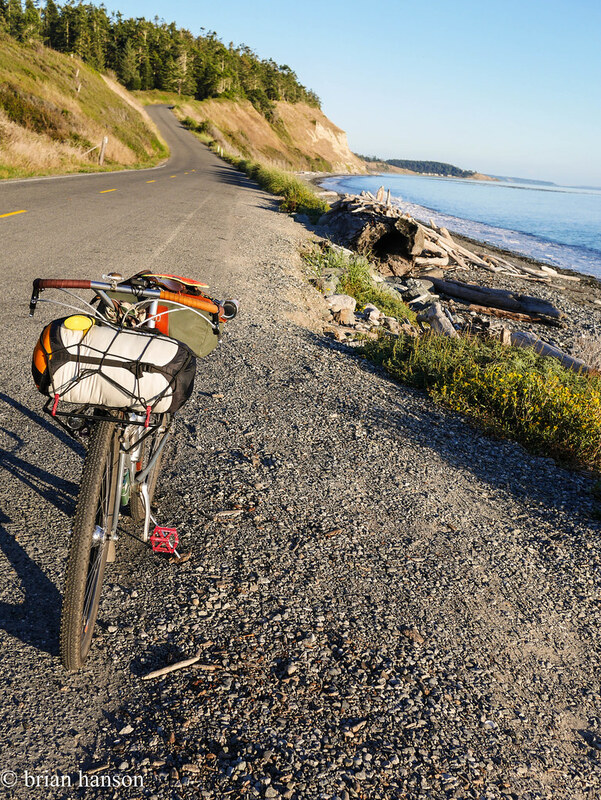 The road down to Ebey Beach is amazing – no shoulder, but equally no cars. 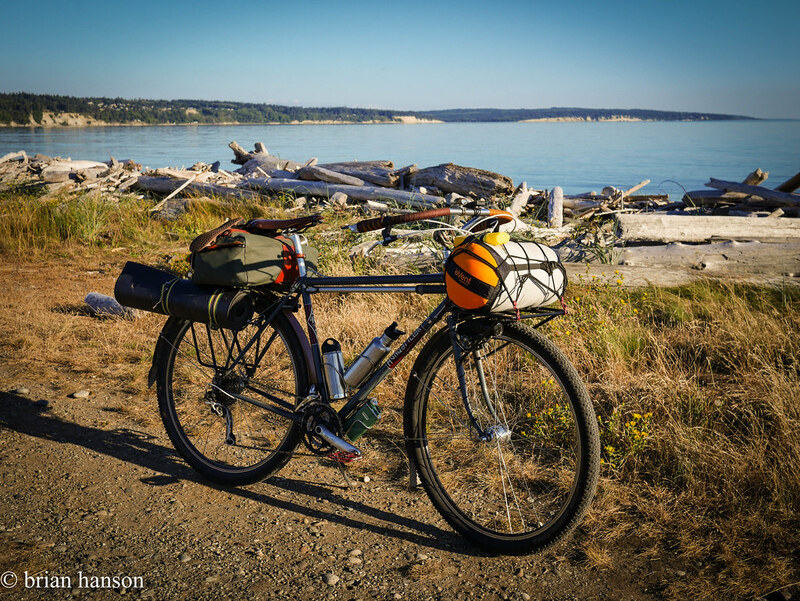 After a short hop up to the bluff, and across an amazing open farming area, it was a quick ride to the new pavement of Madrona Way past the mussel farms in Penn Cove. 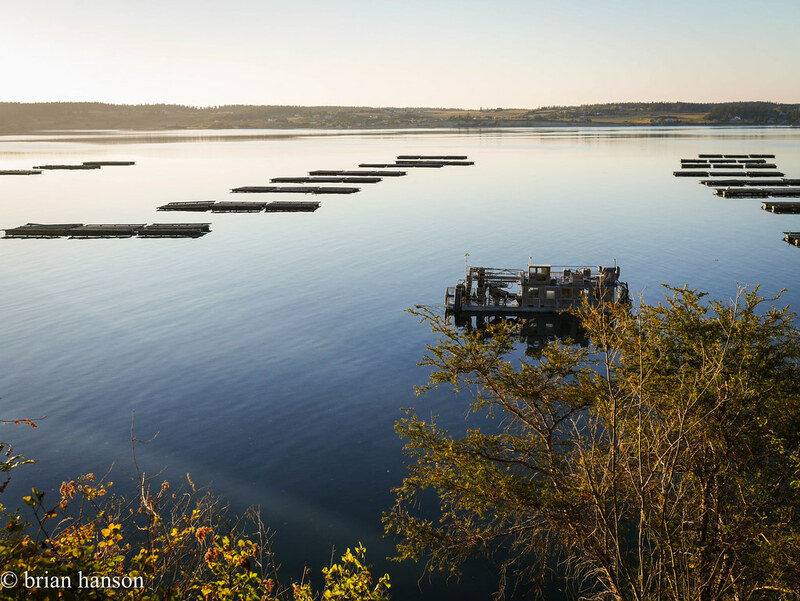 Penn Cove Mussels come from here! At this point, I was starting to worry about sunlight – it had taken me about 2 1/2 hrs to get this far. 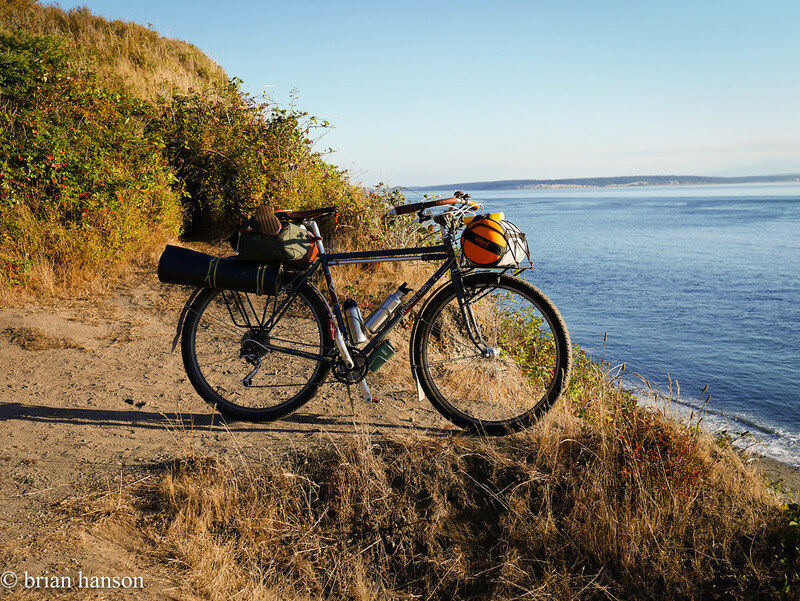 I hurried on into Fort Ebey State Park, and set up the hammock. 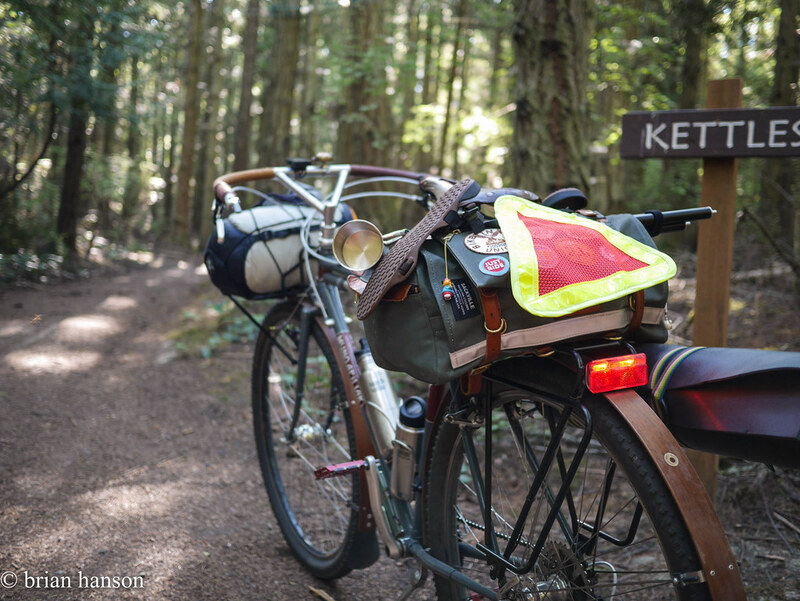 There was one other person in the hike/bike spot – a Pacific Northwest Trail through hiker. 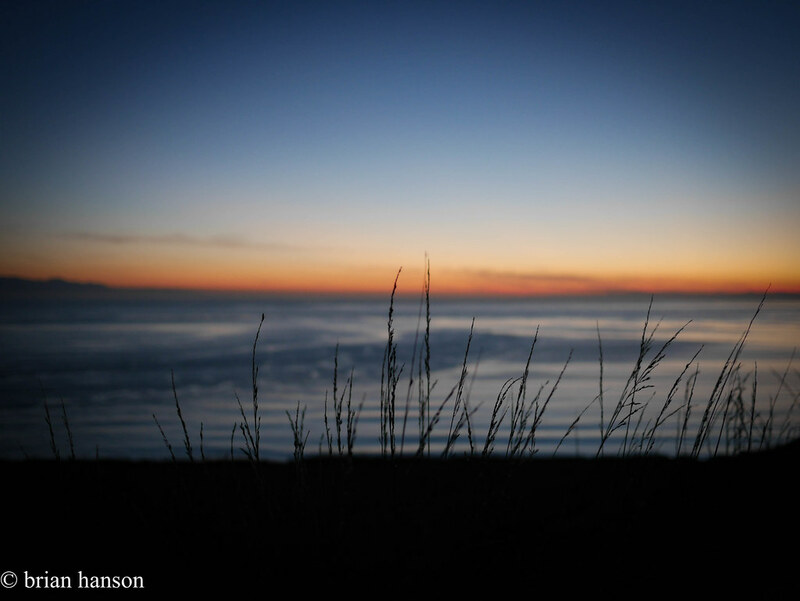 After a dinner of canned salmon on the bluff overlooking the Straights of Juan de Fuca, and a great sunset, it was off to bed. The next morning was sunny, so I geared up and chatted with the hiker to learn about his journey. He was a 65 years old Granite Falls, WA resident, and 7 weeks into the trail that started in Glacier National Park. 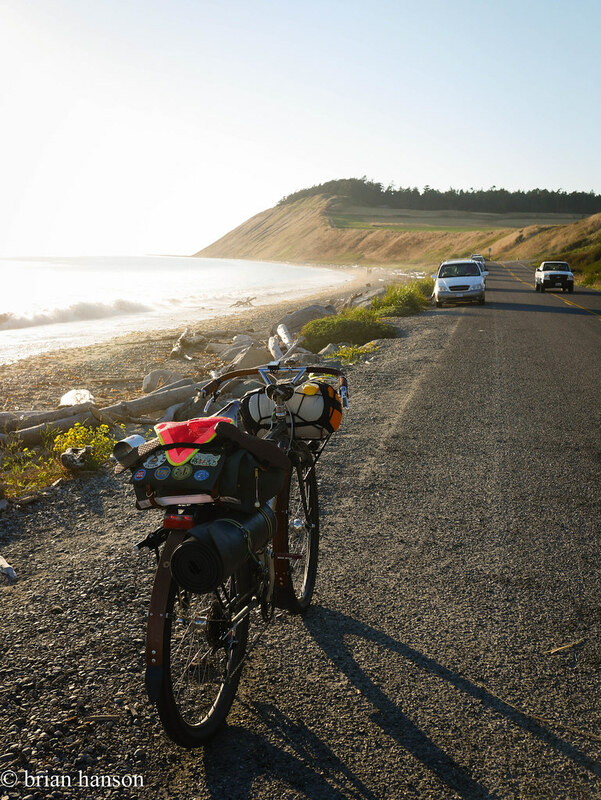 After 8 bears (one grizzly at about 10 yds), a pack of wolves, and countless coyotes, he was just heading to the ferry to Port Townsend to have a lunch reunion with his wife before finishing the last 150 miles to Cape Alava. 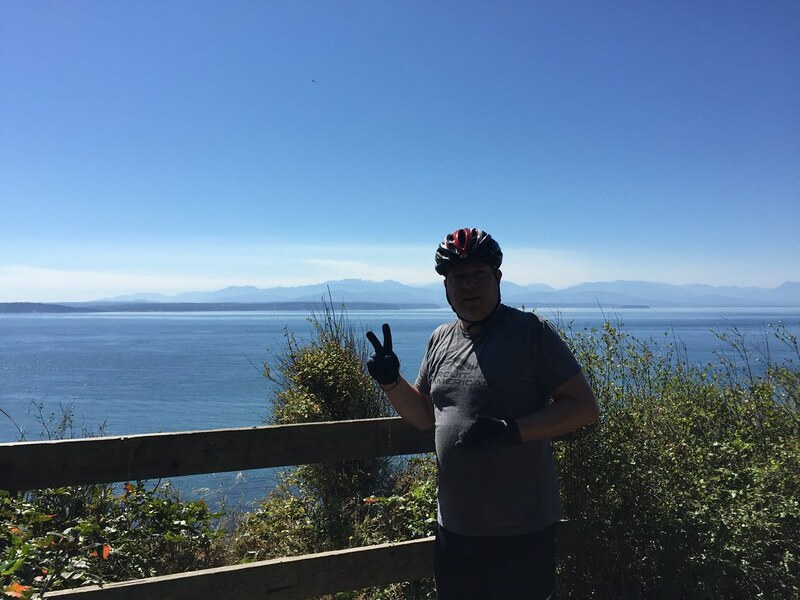 After a nourishing breakfast at the same scenic overlook on the bluff and a water bottle refill, I was off to ride the Kettles trail on the loaded Hunq! 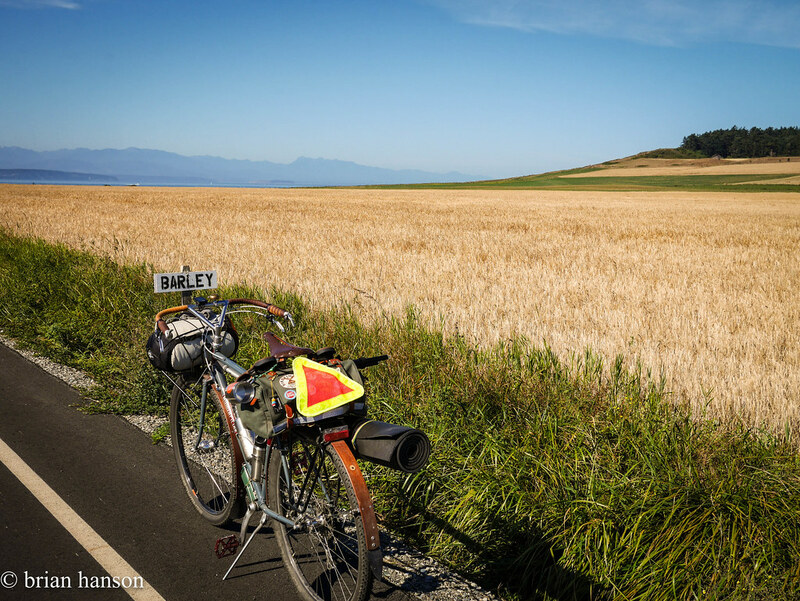 Needless to say, the Hunq made short work of the trail, and I found myself heading back south and past the barley fields to Ebey Beach. 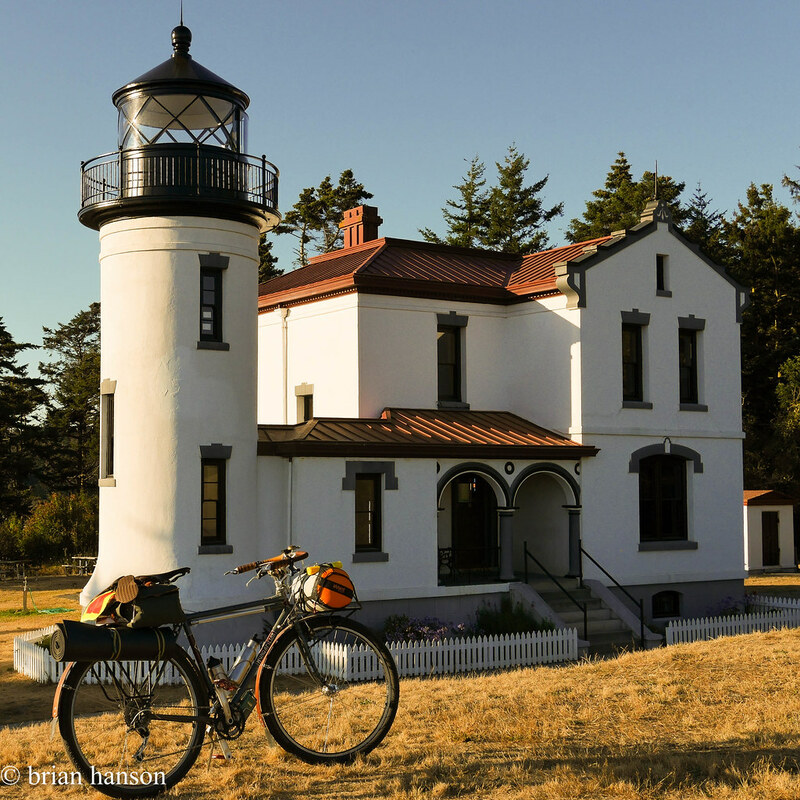 I stopped at the old “Ferry Building” on the bluff to explore and take some pics, then it was back down to Keystone, Greenbank, and finally back to Freeland for some rest and a meal. Sometimes I do something that jump-starts my love of cycling all over again. 25 years ago, it was a ride on my first borrowed mountain bike up near Whistler, BC – felt like a total kid flying over railroad grade grapefruit size rocks, and nearly losing control. 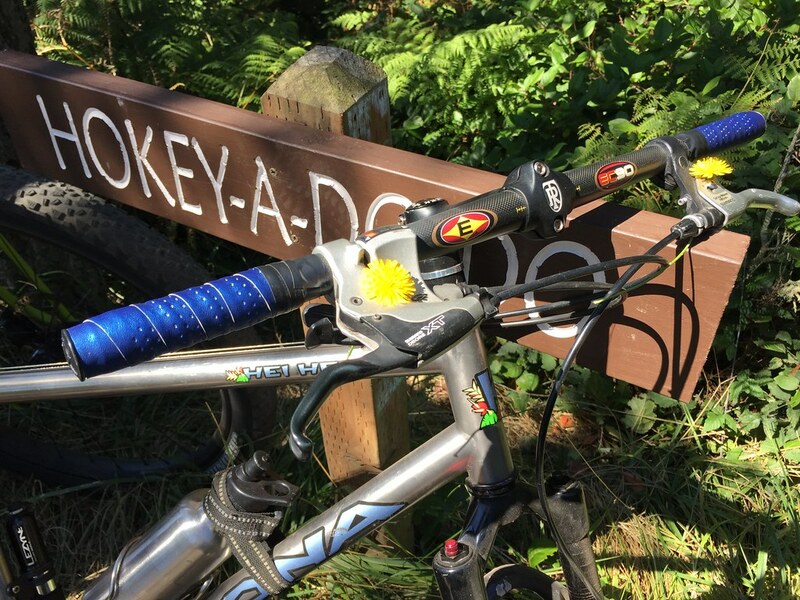 That led to a 10 year segment of regular rides in the local Seattle rooty, muddy mountain trails. 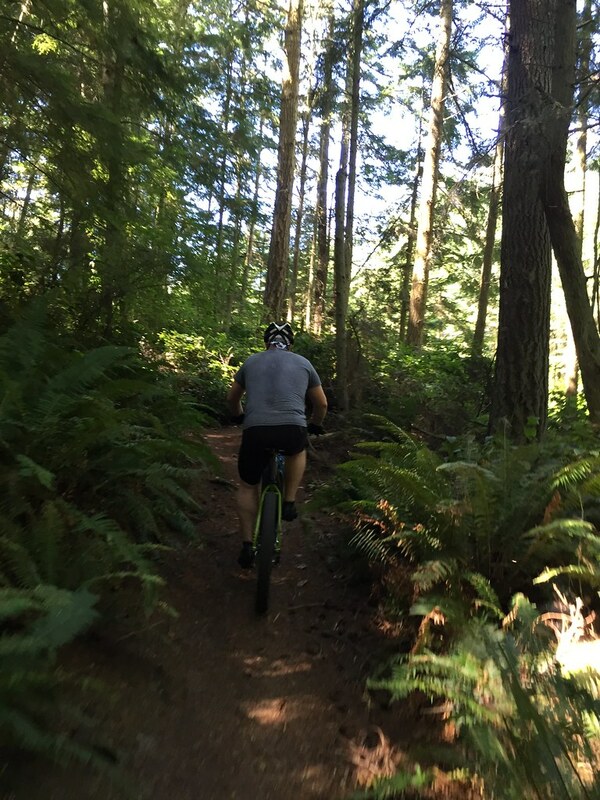 After a few months of putting all my miles in via commuting (a worthy endeavor if you live in a car-choked city like Seattle), I got out for my first mountain biking since Moab a few years back. 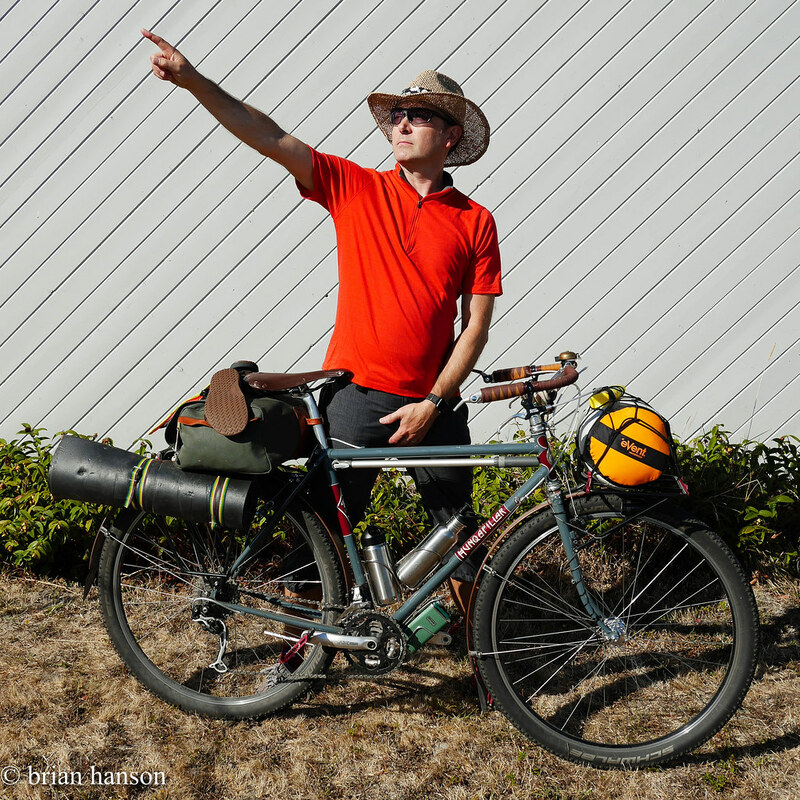 My pal John brought his new Jones Plus up – A bit about John’s bike – it’s a steel frame 27+ mid-fat bike with a very different geometry. I’ll put my notes on this below. 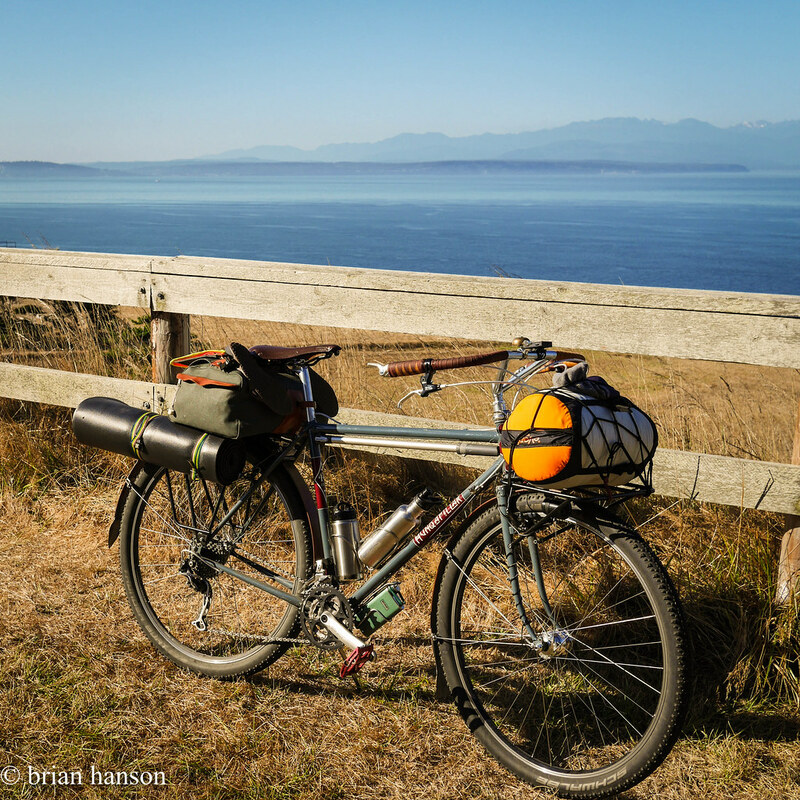 We headed up to Fort Ebey State Park and the Kettles trail system near Coupeville, WA. 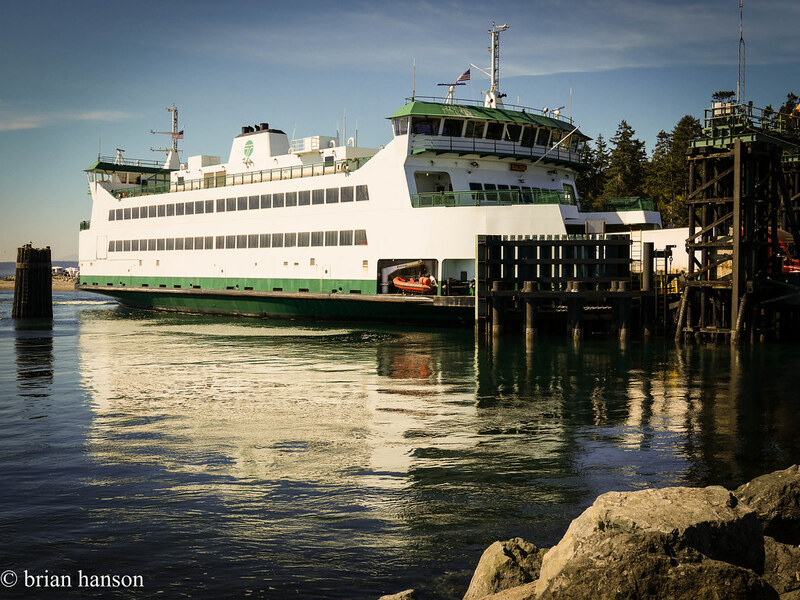 It’s an easy 25 miles north from the Clinton Ferry. John had ridden this area 20 years ago, but I had never been there, so we found our way into the middle of the biking trails and started on what we wanted to be a large loop around the area. There are roughly 25 miles of trails, but a loop is about 5-miles around. The trails turned out to be nice and moderate. Soft forest singletrack with a few rooty spots here and there. 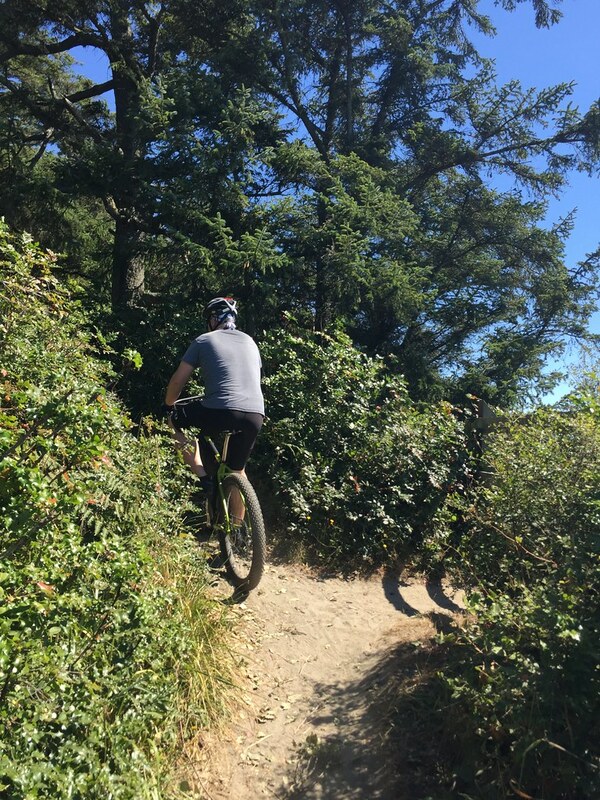 We had a few steep climbs and descents to test our dusty skills and bikes. There was a really nice stretch out of the gun battery that threaded along the edge of a bluff overlooking the Straight of Juan de Fuca. Beautiful! 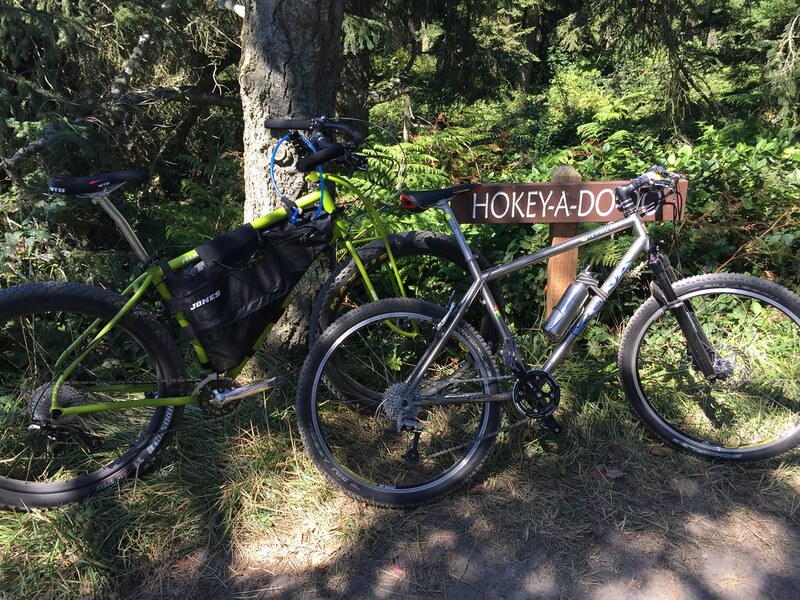 After this, we joined the Hokey-a-do-do section – probably the most fun we had on a nice descent down to the Kettles trail. Bikes. I grabbed my 90’s Kona Hei Hei for its virgin voyage in the dirt. I really loved the light simplicity of the bike. It allowed me to climb some steep tech stuff that I wouldn’t otherwise make it up. 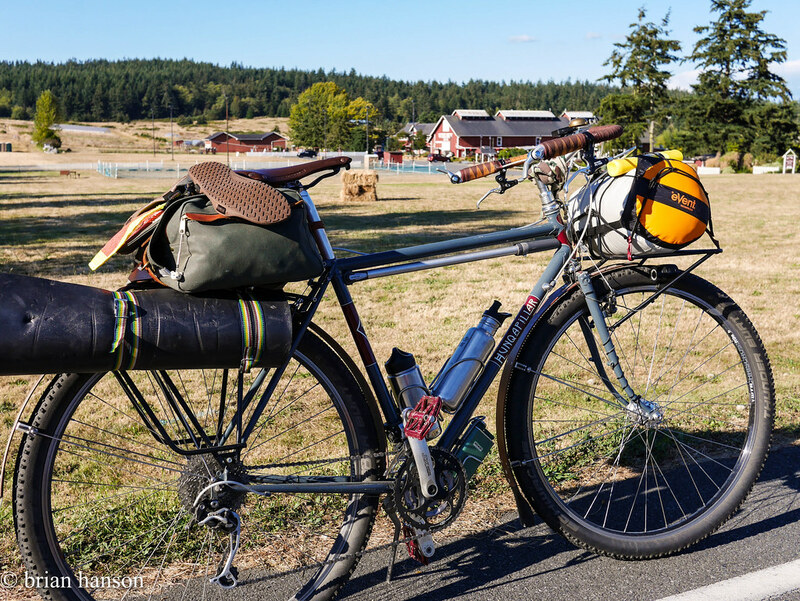 The bike has a single front 32t chainring, and a 10-speed rear with a 34t big ring. I found plenty of torque on this trail. It was actually nice not worrying about a front derailleur. One place to shift. John had his Jones. That bike was a revelation. One of the things I like about mountain biking on singletrack is the sensation of skiing through the woods in the off season. This bike actually accentuated that feeling as I was very upright in my riding position. I felt like I was standing up floating down the path. No feeling of diving down a steep descent. Pretty cool. The bars were wide, but I didn’t have any trouble clearing the few tight spots I encountered. It’s also a traction beast! He rode right over the roots and up the loose gravel without any trouble. I was able to climb a bit better on my Kona, but I only attribute it to the weight. It required more technique in picking my path during one of the ascents which had loose gravel in the middle of the trail. I had to stay to the edges while climbing to avoid losing my grip. I will definitely be getting out to this area more. Only saw a few trail runners the whole day. And this was on a sunny summer Saturday – prime time!